Powered by CFM LEAP-1A engines, the aircraft flies on to Basle, Switzerland where cabin outfitting will immediately commence by AMAC Aerospace. Its new Alberto Pinto cabin interior, which meets Acropolis‘s unique specification, will be installed over the coming months. “This is an historic day for Acropolis Aviation, and we are very much looking forward to presenting the aircraft to our clients at the end of the year,” commented CEO Jonathan Bousfield. Under the guidance of Alberto Pinto designer Yves Pickardt, who also styled Acropolis’s current ACJ319, the ACJ320neo will accommodate 19 passengers, and have a private master bedroom leading to a luxury en-suite with larger shower. The forward lounge and dining area have also been enlarged to deliver the highest levels of comfort, with the very latest technology and connectivity – optimised for work and leisure. “Our new aircraft will be an evolution of our highly popular cabin in G-NOAH, retaining the traditional and comfortable style, and will continue to optimise the use of space to ensure the cabin is the market leader. The versatile accommodation is designed to appeal to our diverse range of travellers, from heads of state to private individuals flying on business and on leisure,” added Jonathan Bousfield. Acropolis Aviation is a leading luxury charter operator based at Farnborough Airport, with a complementary sales office in Fort Lauderdale, USA. Headed by CEO Jonathan Bousfield, the company employs 28 personnel. Its flagship Airbus ACJ319 entered service in March 2010 and the company has gained a reputation for excellent service in the high-end charter market. Acropolis holds Wyvern Wingman safety accreditation. Acropolis’s ACJ319 G-NOAH is regarded in the industry as the ultimate luxurious charter aircraft. Its cabin, designed by Alberto Pinto, features an open-plan forward lounge, intimate rear lounge, separated by a mid-cabin conference and dining room. The private master bedroom features a king size bed, luxury en-suite bathroom and a large, rectangular shower, the first to be installed in an ACJ. Seating 19 passengers, the aircraft can accommodate up to 13 on fully lie-flat beds. Acropolis announced it would be launch customer for the Airbus ACJ320Neo in May 2015. The Airbus ACJ320 family currently comprises the ACJ319neo, capable of flying eight passengers 6,750 nm/12,500 km or more than 15 hours, and the ACJ320neo, which can fly up to 25 passengers 6,000 nm/11,100 km. 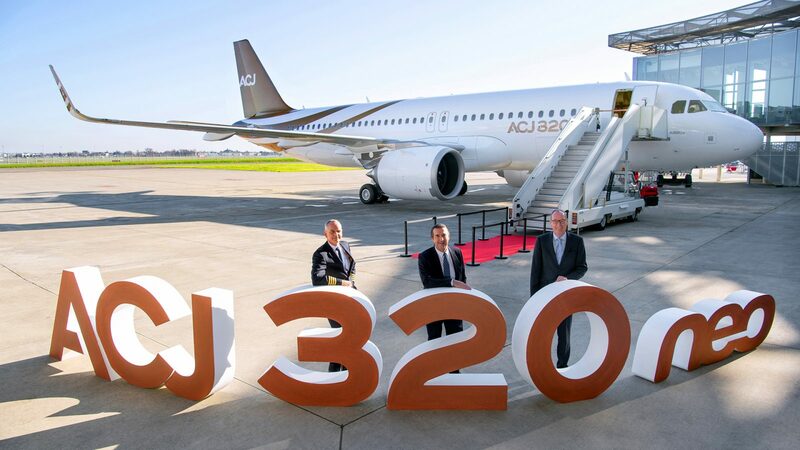 In addition to its new fuel-saving engines and sharklets, ACJ320neo family aircraft have the widest and tallest cabins of any business jet, without costing more to operate or taking up more ramp space.